See Part 1 and Part 2. Read the entire series. 9 July 2011. As immune-based therapies targeting Aβ and tau are beginning to show promise for the treatment of Alzheimer’s, what about other disorders of the nervous system? At the 2nd International Conference on Neurodegenerative Disorders: Immunotherapy and Biomarkers, which took place 26-27 May 2011 at Uppsala University, Sweden, researchers outlined potential immunotherapies for Parkinson’s and other synucleinopathies, amyotrophic lateral sclerosis, and even prion diseases. The last have been a tough nut to crack, because the immune system strongly recognizes prion protein as self and fails to mount a response to prion antigens. The variety of different immune strategies discussed at the meeting spoke to how seriously scientists are pursuing this approach. Eliezer Masliah, University of California, San Diego, reported on immunotherapies against α-synuclein, the principal component of Lewy body aggregates that characterize Parkinson’s and other synucleinopathies. Masliah told the audience that he is not interested in targeting Lewy bodies per se, but toxic α-synuclein oligomers. Though α-synuclein is predominantly an intracellular protein, it also extrudes from cells in different forms (see Lee et al., 2005), and synuclein toxicity propagates from cell to cell (see ARF related news story). Oligomers extruded from cells could be mopped up by antibodies, suggested Masliah. Together with Dale Schenk and Dora Games at Elan Pharmaceuticals, San Francisco, California, Masliah previously developed an active α-synuclein vaccine that helps rid mice of the protein (see ARF related news story on Masliah et al., 2005). At Uppsala, he reported on a passive immunotherapy. 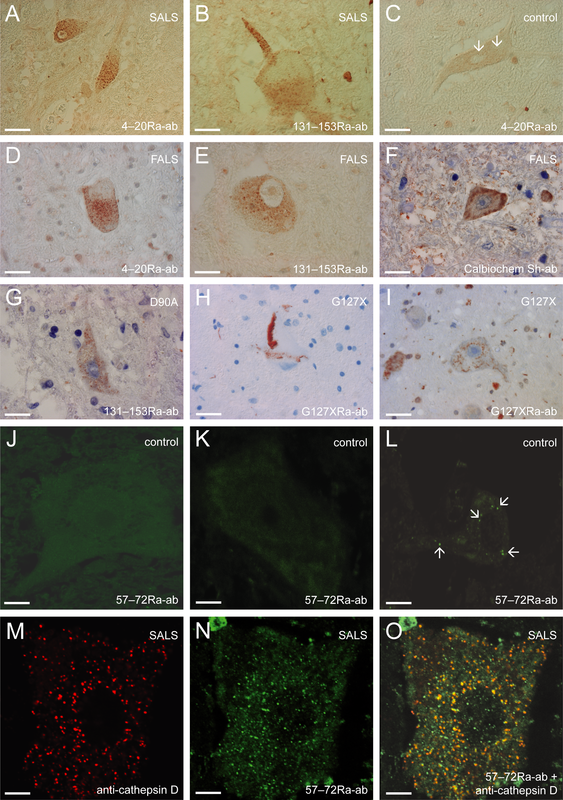 To test it, Masliah and colleagues used an α-synuclein transgenic mouse model of Lewy body disease in which the protein deposits in the temporal cortex and hippocampus. These mice lack full motor control and have poor cognitive skills (Masliah et al., 2000). Masliah reported on a monoclonal antibody, 9E4, that recognizes the C-terminal end of the protein and labels intraneuronal synuclein aggregates in brain tissue. When six-month-old α-synuclein mice received twice-weekly intraperitoneal injections of 9E4 for six months, they outperformed control transgenic mice on both the rotarod test of motor function and the Morris water maze test of spatial learning and memory. The treated transgenic mice performed about as well as wild-type controls. How does 9E4 rescue this phenotype? By fluorescent labeling, Masliah and colleagues tracked the antibody as it entered the central nervous system, where it labeled granular structures inside neurons of the temporal cortex and the CA1 of the hippocampus. The antibody colocalized with α-synuclein, and also with lysosomal markers including LC3. The results hinted that 9E4 protects mice by penetrating deep into the brain, reacting with α-synuclein, and ferrying it to lysosomes for degradation. In support of this, the treatment reduced the amount of α-synuclein in the cortex and hippocampus, while a control IgG had no effect. Treated mice exhibited more post-synaptic density 95 and synapsin 1 protein in the brain, suggesting synapses were protected against α-synuclein toxicity. 9E4 reduced the amount of calpain-cleaved α-synuclein. This truncated form of synuclein is believed to serve as a template for aggregation. Much of this work was recently published (see Masliah et al., 2011). Another antibody seems to encourage glial cells to take up and destroy the protein. Named 274, this antibody completely obliterated α-synuclein accumulation in astroglia, said Masliah, yet had little effect on neurons. Masliah concluded that antibodies can dispatch the protein in at least two ways: by stimulating lysosomal degradation in neurons, and by activating clearance in glia. The latter could be more important for multiple system atrophy (MSA), a disease characterized by glial accumulation of α-synuclein. Masliah said he plans to test 274 in a mouse model of MSA, where the myelin basic protein promoter drives overexpression of α-synuclein in glia. Martin Ingelsson, Uppsala University, reported a different approach toward synuclein immunotherapy, focusing on antibodies that recognize induced protein oligomers. Because α-synuclein oligomers are fleeting entities, Ingelsson and colleagues developed a screen to find chemicals that coax the protein to form stable oligomers. Two chemicals generated from lipid oxidation, 4-oxo-2-nonenal (ONE) and 4-hydroxy-2-nonenal (HNE), turned out to potently induce α-synuclein oligomerization, though with slightly different outcomes. Atomic force microscopy revealed that ONE-induced oligomers are amorphous and less dense, while oligomers formed in the presence of HNE have a protofibril-like structure, Ingelsson said. Both are toxic to neuroblastoma cells (see Nasstrom et al., 2011). Mice immunized against these induced oligomers generated an antibody, 49G, with some promising characteristics. It recognized antigens in brain tissue of PD patients and also brain samples from transgenic α-synuclein mice. In fact, the antibody detected antigens in the brain of A30P α-synuclein mice as young as four months old, some six months before these mice normally begin to display pathology. This finding supports the idea that oligomers form well in advance of visible protein aggregates, and suggests that early treatments with antibodies like 49G could slow or halt the disease process. Ingelsson said that cells take up the antibody, which then seems to attenuate α-synuclein aggregation. While the antibody may help clear such aggregates, it also seems to prevent their formation: When cells express synucleins attached to different domains of green fluorescent protein (GFP), 49G reduces the fluorescence that occurs when synucleins bind together and effectively reconstitute the full GFP. Ingelsson plans to test the antibody in a preclinical trial using transgenic mice to see if it will limit pathology. Jean Pierre Julien, from the University Laval in Québec, Canada, outlined two different therapeutic strategies for treating amyotrophic lateral sclerosis (ALS)—traditional antibodies and intrabodies. The latter are antibody genes hidden, Trojan horse-style, inside viral vectors. Julien and colleagues generated traditional monoclonals against the copper-zinc superoxide dismutase 1 (SOD1), which misfolds when mutated to cause rare familial cases of ALS. Three of them, B8H10, D3H5, and A5C3, did not recognize wild-type SOD1, but did recognize a range of different mutants, suggesting that they bind to epitopes that emerge when the protein adopts non-native conformations (see Gros-Luis et al., 2010). In a G93A SOD mouse model of ALS, the antibodies detected aberrant protein aggregates in motor neurons before any onset of symptoms. Slowly pumped into mouse brain ventricles at around the time of disease onset (85 days old) D3H5 increased survival by six days when administered over 28 days. When treated from day 65, mice survived nine days longer than controls. Julien said that the antibody mostly ends up in motor neurons and microglia, which have both been implicated in pathology in ALS (see ARF related news story). Antibodies lacking the antibody Fc tail also extend lifespan in this mouse model, though less efficiently than the full antibody, said Julien. Nevertheless, this opens up the possibility of using single-chain antibodies, which may penetrate the brain more readily than full-sized immunoglobulins and are less likely to induce unwanted immune reactions. Julien has started treating mice with single-chain antibodies, but said it is too early to know what effect they have. Julien is collaborating with Biogen Idec, Boston, Massachusetts, to develop humanized antibodies for clinical trials. Though SOD mutations cause but a minor fraction of ALS cases, aggregates of the protein form in tissue from sporadic cases, too, (see ARF related news story), suggesting that an anti-SOD therapy might have broad utility. Furthermore, Julien reported discovering an interaction between TDP-43 and p65/RelA, a member of the NF-κB family of transcription factors. TDP-43 aggregates occur in nearly all cases of ALS and some other neurodegenerative diseases, such as frontotemporal dementia and some Alzheimer’s cases, making it an attractive therapeutic target. What role the protein plays in pathology is still unclear. It is an RNA-binding protein, and when it aggregates, it alters expression of many genes (see ARF related news story). Julien found the interaction between TDP-43 and p65 using an immunoprecipitation approach. He said that in ALS spinal cord neurons, p65 shifts into the nucleus, suggesting that it may be playing a role in pathology, which is the opposite of what happens with TDP-43, which mislocates into the cytoplasm. Exactly how the two proteins might conspire to promote disease is unclear, but Julien reported that withaferin A, an NF-κB inhibitor, reduced neuronal toxicity induced by glutamate, and also reduced gliosis and nuclear p65 in TDP-43 transgenic mice, supporting p65 as a potential drug target. Julien said he is working on intrabodies to target the TDP-43/p65 interaction to see if they can reduce pathology in TDP-43 mouse models. One group of neurodegenerative diseases that have been particularly challenging from an immunotherapy perspective are the spongiform encephalopathies, or prion diseases. As Claude Carnaud, INSERM, Paris, France, pointed out, the cellular prion protein (PrPc) is ubiquitously expressed in the body, even in immune cells, so the immune system recognizes PrPc as self and will not attack it. The immune system is a poor reservoir for prion antibodies, those that do remain have low affinity, and new epitopes formed upon conversion of PrPc to toxic prions do not seem to trigger immune responses, said Carnaud. In short, researchers must be inventive if they want to evoke the immune system to tackle prion diseases. Carnaud reported on two possible tacks. Dendritic cell vaccination uses bone marrow-derived dendritic cells (these are cells of the immune system) to spur naive B cells to produce antibodies to PrPc, breaking the immune tolerance for this ubiquitous protein. Adoptive T cell transfer uses T cells from a host that has no immune tolerance, such as a PrPc-negative mouse. Carnaud and colleagues have had some success treating mouse models of prion disease with both approaches. For the former, the authors first established which prion peptides elicited the best immune response by injecting several into PrPc-negative animals, which lack immune tolerance toward the protein. Next, they used the most antigenic peptides to load up dendritic cells to present the antigens to the immune system of wild-type mice. Dendritic cells harboring a peptide corresponding to PrPc amino acids 98-127 not only induced an immune response, but lengthened the survival of mice injected with a lethal dose of scrapie prion. The animals survived an average of 254 days, versus 212 days for controls (see Bachy et al., 2010). Survival time correlated with the amount of anti-PrPc antibody in the serum. For adoptive cell transfer, Carnaud and colleagues also used cells from PrPc-negative animals challenged with prion antigens. They transplanted T lymphocytes from those animals to wild-type mice. The transferred cells protected the animals from amassing toxic prion in the spleen. Adoptive T cell transfer also extended the lifespan of mice injected with scrapie by about 30 days, said Carnaud (see also Gourdain et al., 2009). Protection did not correlate with anti-prion antibodies in circulation, suggesting that this method evokes a predominantly cellular immune response. Whether either of these strategies would work in humans remains to be seen. The approach would be to remove a patient’s immune cells, expand them to great numbers while challenging them with a suitable antigen, then put them back into the patient. Oncologists are studying this strategy to overcome immune tolerance to cancers (for a review, see Schumacher et al., 2009). Immunotherapies for AD, PD, and some other neurodegenerative diseases are in their infancy. In contrast, natalizumab (tysabri), produced by Biogen Idec, is approved for the treatment of relapsing multiple sclerosis (MS) in the US., and relapsing-remitting MS in the EU. As Biogen’s Alfred Sandrock pointed out, many other immunotherapies for MS are in various stages of development. Alemtuzumab, which depletes CD4/CD8 T cells, is currently in Phase 3, and results should be available soon, he predicted. In Phase 2, the therapy reduced disability by 70 percent, and relapses by 75 percent. Ocrelizumab, sponsored by Genentech and Hoffman-La Roche, suppresses B cells and reduces lesions and relapses. Though there was one death reported in Phase 2 and a trial for lupus has been halted, that treatment is entering Phase 3 for MS as well. Daclizumab, being developed jointly by Biogen and Abbot (see related news), is also in Phase 3, and results are expected this summer. Sandrock said the late progression phase of MS is still difficult to tackle. Losses and gains of the myelin sheath that insulates axons characterize this phase of the disease. Remyelination is a hit-and-miss affair, and it is unclear why, said Sandrock. Blocking the protein leucine-rich repeat and Ig domain-containing 1 (aka LINGO-1), which suppress myelination by limiting maturation of oligodendrocytes, might be one potential avenue for boosting remyelination. Sandrock and colleagues found that knocking down LINGO-1 with interfering RNAs boosts maturation of oligodendrocytes and promotes remyelination. In a mouse model of MS, an anti-LINGO-1 antibody increases myelination. In humans, this can be measured using magnetization transfer ratio, a form of magnetic resonance imaging. Anti-LINGO-1 therapy has entered Phase 1, and Sandrock said Biogen hopes to begin Phase 2 next year using MTR as an outcome measure. Researchers at the meeting took encouragement from the relative success of the MS programs and in the breadth of new potential treatments entering or in clinical trials. The general feeling was that if immunotherapy can work for MS, then similar treatments for AD, PD, and other neurodegenerative diseases may follow suit. This is Part 3 of a three-part series. See Part 1 and Part 2. Read the entire series.